Sometimes you just gotta have those golden rinds and there’s no stopping you from the crunchy goodness. 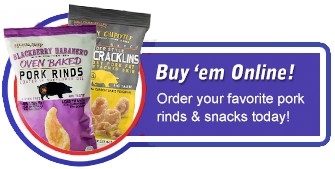 Use our Locator to find your favorite pork rind snack. Or if you have a few days to wait, buy online and have your pork skins delivered right to your door. Either way, we'll help you find the rind.